Design knows no boundaries and this is true of kitchens, living rooms, or even lofts for that matter. There always is the opportunity to imbibe your own personal sense of space into the area of your home that you are designing. When it comes to a smaller kitchen, you might not exactly love the fact that there are only a couple of feet between your refrigerator door and the cabinets, but with the right use of color, patterns and materials you can turn the narrowest gallery kitchen into a haven! We've scoured the homify diaries to present to you the cream of the crop of small kitchens. This compact cozy L-shaped kitchen has it all- right from functionality to aesthetics and is a classic example of less being way more! The white cabinetry is accompanied by metallic handles that add a nice contrast while the wooden kitchen top is met by it's counterpart lining the walls of this kitchen. To finish off the kitchen incorporates neon lamps. Open shelves have a charm of their own as this next kitchen demonstrates. The interesting feature of open shelving is that you have plenty of room for experimentation. You could either choose to keep your pots and pans out in the open or choose to make use of baskets or containers to keep them. With the latter, you have the choice of switching things up a bit when it comes to color, patterns and design. 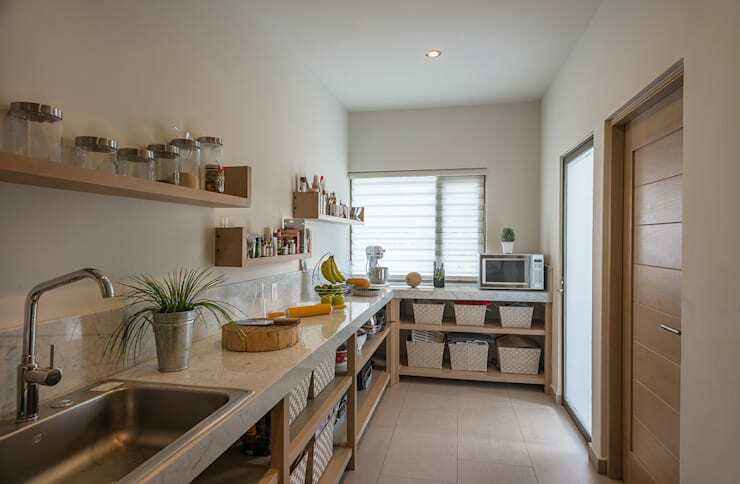 Cupboard doors can make your kitchen look cramped, so opt for these open plan shelves instead. 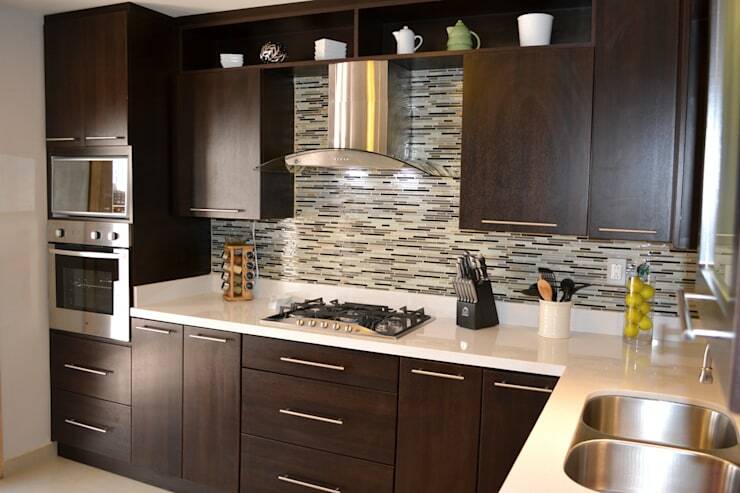 Walnut wooden cabinets add a refreshing touch to the kitchen shifting focus away from its size. A marble white counter top contrasts the cabinets while the tiling of the kitchen wall meets the two in between. How's that for refreshing? Don't take our word for it, see what the professionals of homify have to say! 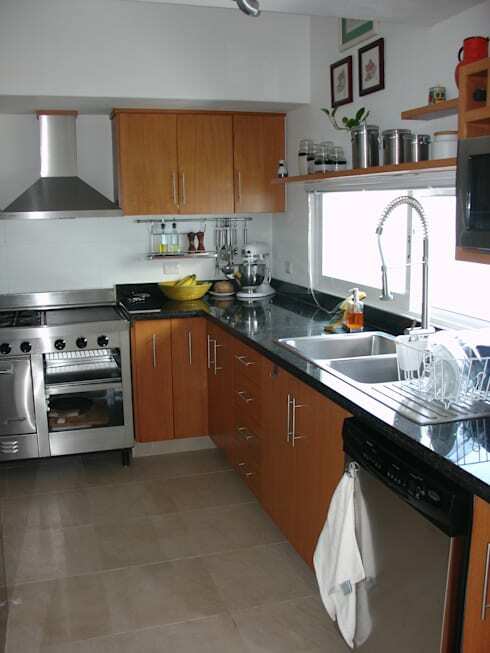 Quartz is made the king in this kitchen with white kitchen cabinets as its pleasant subjects. 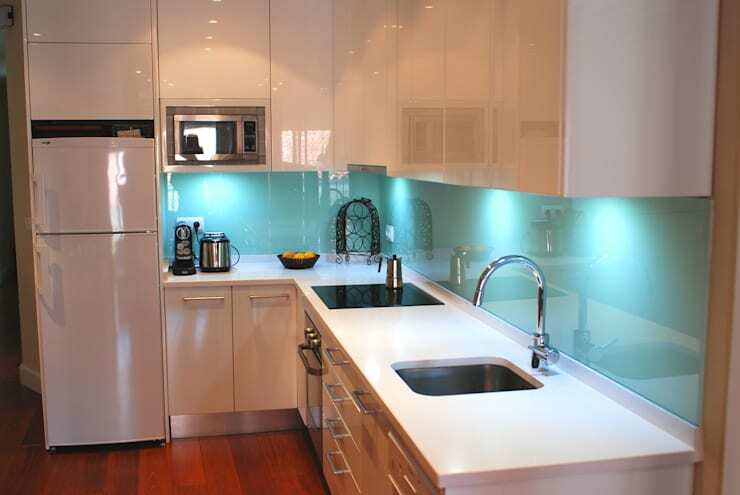 The kitchen counter top makes for a reflective surface which is the highlight here. The metallic kitchen appliances and chimney make for the perfect fit. Practical storage solutions for the kitchen are the most sought out for. Be sure to pay them due attention. If you adore all things minimalist, then an L-shape kitchen such as this is your best bet. It is compact and sleek- bound to lure you in. 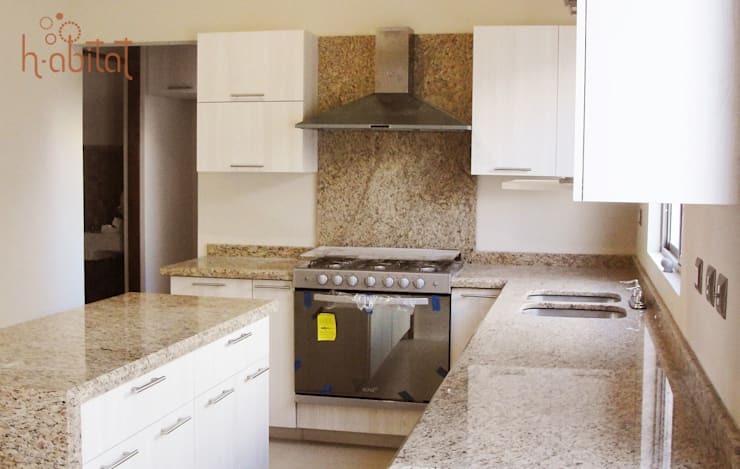 The cabinets are come with a porcelain like finish while the kitchen top is of a vanilla white hue. 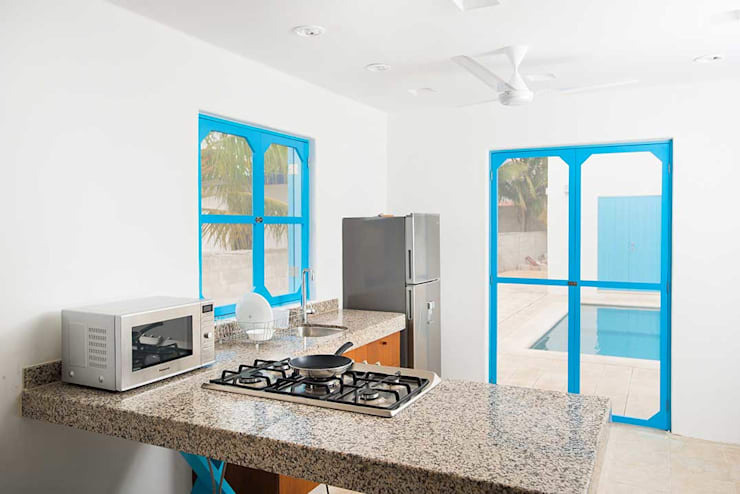 A petite L shaped kitchen snuggled away in the corner of this house tells a story of its own that will only be told if the blue bordered doors and windows are opened. An all white ensemble with a granite kitchen top and metallic appliances complete this tale all too perfectly. 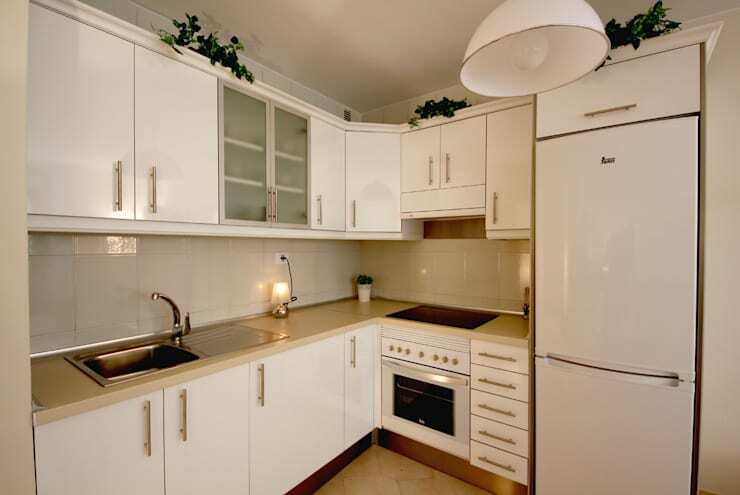 Wooden cupboards and standard appliances ensure that your kitchen is trendy and tasteful for many years to come. It's the classic combination of wooden cabinets, granite kitchen tops and metallic appliances that have been stealing the show since the beginning. 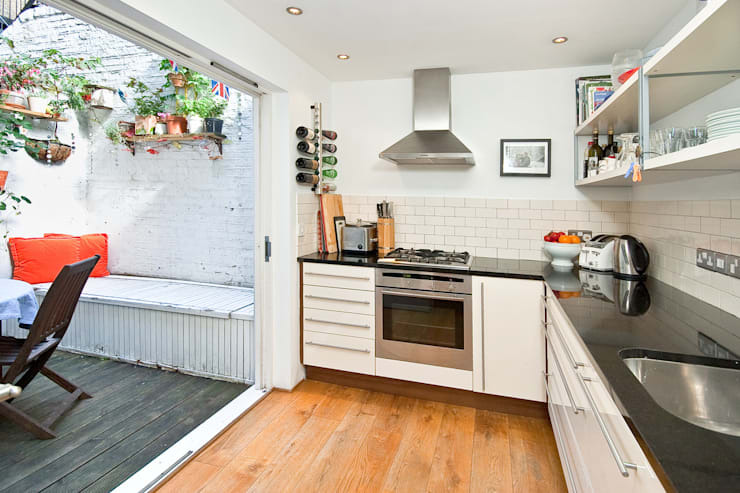 A small kitchen can even include an informal dining area for those quick morning meals as this one demonstrates. This whitewashed kitchen is so perfectly petite, you wouldn't want to change anything about it. All you have to do is to pull those brown shutters up and let the light in. The L-shape kitchen design makes use of those corners for storage, keeping your home organised and tidy at the same time. An ivory counter top is the cream of the cake that is this white cabinet bound kitchen. 11. Black is the new black in this kitchen! 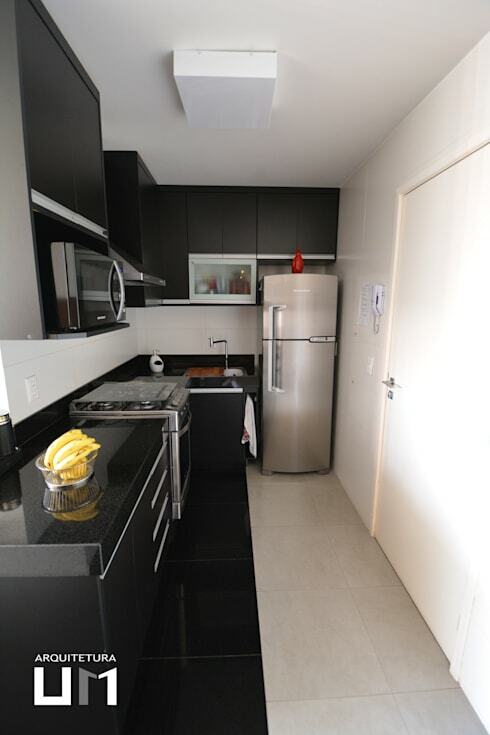 If you belong to the class of elitists that seek the charm of the sleek and sophisticated, then a black kitchen could just be the most stylish option for your living space. Right from the cupboards to the appliances this kitchen makes sure that it exudes nothing short of opulence. 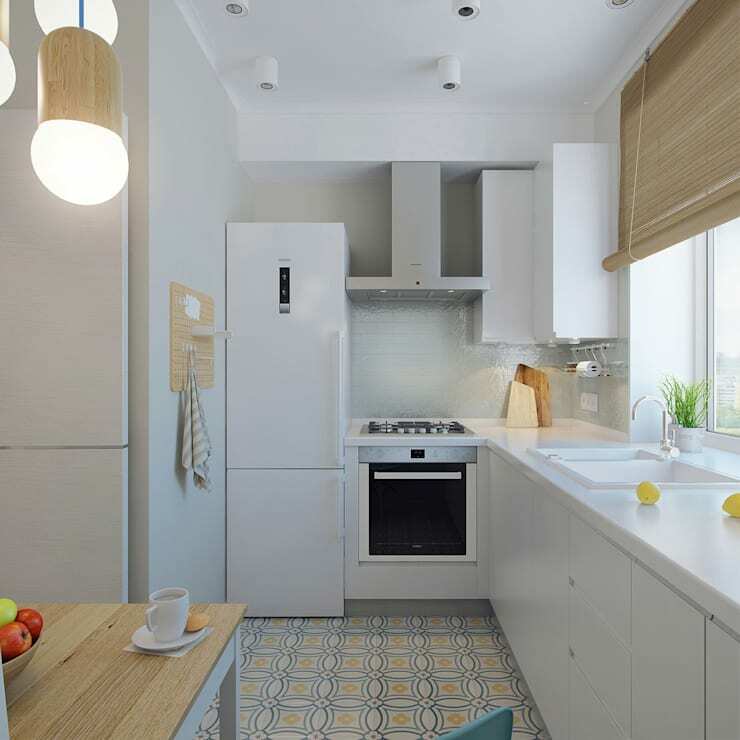 This kitchen enjoys fresh air from the lovely entourage of flowers that reside beside it and hardwood flooring for that Scandinavian inspired design. Simple subway tiled walls meet the kitchen counter top with utmost subtlety. Here are 29 kitchen designs that you can't resist!